As I have mentioned before on this blog, I moved to Hoboken without a “real job.” This means that my income was based on minimum wage and that I was living mostly on savings. My initial goal was to get a job as soon as possible, but I also didn’t want to be stuck in a career or job that didn’t suit me since that’s why I left the district in the first place. Since I had some room to be picky, I didn’t feel compelled to accept a job I really didn’t like, but to get some practice in and to widen my search net I signed up with a temp agency right when I moved. This means that I’ve been on a lot of job interviews. During the fall I went to about 20 interviews in two and a half months. And now that my publishing internships have finished and the industry is in a hiring flurry, I’ve gone on even more, sometimes as many as five in a week. Ask me if I got any of those jobs and I’ll give you a really bitter and sarcastic answer. The reason this question makes me want to scream is because I really honestly have no idea where I want to be in five years. And I guess I could talk about how I can’t even plan for next week, let alone a year or five years from now so why should it matter. But I don’t think that’s true. I know how I want my life to look like…or at least I know how I want to feel about it. I’ve tried to figure out why I haven’t really thought about planning for my future. Is it because I don’t have the means to visualize a future at all? 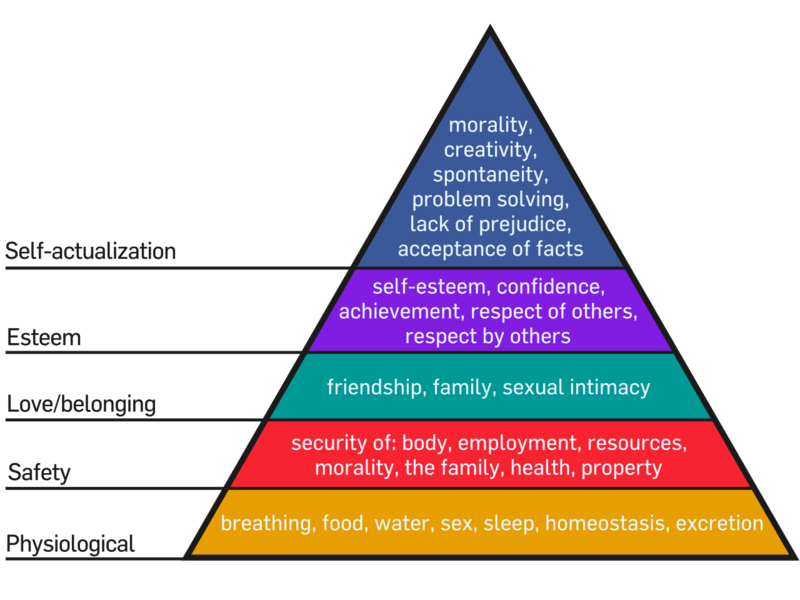 Abraham Maslow, a famous psychologist, developed this theory about the hierarchy of human needs – basically if humans cannot satisfy their lower needs like health, safety, and food, then they cannot reach self-actualization. So maybe I can’t visualize a future because I cannot satisfy my more basic needs like financial security. Not as good as the food pyramid…but we’ll make due. Do I agree with this theory? Yes and no. Like most other psychological theories it applies until it doesn’t. But it does make me think about why I haven’t been able to see past getting a job to a career or a life that’s greater or more personal. I feel as though I missed this past year because my focus has been solely on finding a way to support myself – by myself – so that I may find what else motivates me to become a “self-actualized” human. When I hear the term “career” or “job” nothing very specific comes to mind. I just think about how I desire a job or a career that’s fulfilling, that I believe helps make the world a better place in some way and that my contribution means something. But ultimately I think that my job is a means to very different end. What I’ve come to realize is that all of my goals have been more life-oriented. Such as, I want to live in as many cities as I can or at least out on the west coast someday. I want to live abroad again. I want to meet many interesting people and maintain the friends that I love. I want to write a book and a movie and I want to see them get made (arguably that’s kind of a career goal but since that’s all less likely to happen and it’s not really an industry per se I am putting it into the life category). I think this why I am drawn to careers where I can be independent, where I can set my own hours, where I can essentially be my own boss, because I am afraid if I get stuck somewhere in a career or a job then I might not be able to accomplish any of those life goals, which are so much more important to me than any sort of career aspect of my life. But I also know that the majority of my time will be spent at my job and I want to love it and to believe in it and to find satisfaction in it. Right now I don’t know what that satisfaction looks like. It’s not really something I can put into words. I think I have found a good industry; there is nothing I would rather promote, sell, or associate myself with more than books. But my desires, my needs, and the actions that drive me forward are deeper and more abstract than anything a 9 to 5 job could provide. So I continue the search, both on job boards and within myself. If I am being honest, college freshman Kelly would never have thought she would be where she is today. But I think she’d be pretty impressed with what I have accomplished so far.